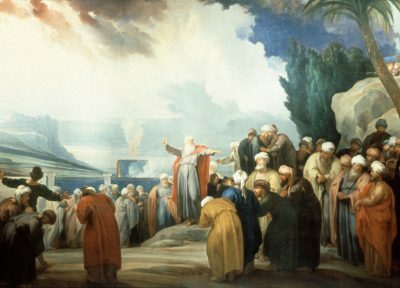 Today’s Gospel begins with a scene that recalls a similar moment in the history of Israel, the episode recalled in today’s First Reading. The seventy elders who receive God’s Spirit through Moses prefigure the ministry of the apostles. Like Joshua in the First Reading, John makes the mistake of presuming that only a select few are inspired and entrusted to carry out God’s plans. The Spirit blows where it wills (see John 3:8), and God desires to bestow His Spirit on all the people of God, in every nation under heaven (see Acts 2:5, 38). God can and will work mighty deeds through the most unexpected and unlikely people. All of us are called to perform even our most humble tasks, such as giving a cup of water, for the sake of His name and the cause of His kingdom. John believes he is protecting the purity of the Lord’s name. But, really, he’s only guarding his own privilege and status. It’s telling that the Apostles want to shut down the ministry of an exorcist. Authority to drive out demons and unclean spirits was one of the specific powers entrusted to the Twelve (see Mark 3:14–15; 6:7, 13). Cleanse me from my unknown faults, we pray in today’s Psalm. Often, like Joshua and John, perhaps without noticing it, we cloak our failings and fears under the guise of our desire to defend Christ or the Church. But as Jesus says today, instead of worrying about who is a real Christian and who is not, we should make sure that we ourselves are leading lives worthy of our calling as disciples (see Ephesians 1:4). Does the advice we give, or the example of our actions, give scandal—causing others to doubt or lose faith? Do we do what we do with mixed motives instead of seeking only the Father’s will? Are we living, as this Sunday’s Epistle warns, for our own luxury and pleasure, and neglecting our neighbors? We need to keep meditating on His Law, as we sing in today’s Psalm. We need to pray for the grace to detect our failings and to overcome them.